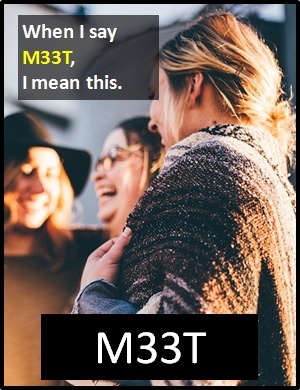 M33T | What Does M33T Mean? Do you want to M33T at Smokey's place? One day you will M33T the right one. Orla: I want to see what you really look like. Kevin: M33T me tonight then. Sol: Where were you last night? Zac: I went to M33T my internet date. M33T is defined as a cyber term because some of its characters are used as substitutes for letters. Most cyber terms were introduced to reduce the number of key strokes required to write the word, but since the arrival of predictive texting and keyboards on mobile devices, this efficiency is no longer required. Nevertheless, cyber terms are still regularly used to make messages more entertaining or to express individuality. Cyber terms differ from icons because they are not pictorial representations. I'm going to M33T the owner today. Before the digital era, we would have just said "Meet" instead of using the cyber term M33T.